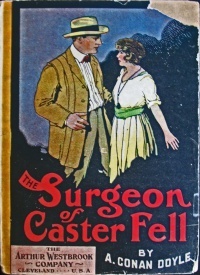 The Surgeon of Gaster Fell is a short story written by Arthur Conan Doyle first published in Chambers's Journal in four parts from 6 to 27 december 1890.
in Golden Hours (february 1907 [UK]) 1 ill.
James Upperton stays in pension Kirkby-Malhouse in Gaster Fell in Yorkshire waiting his cottage to be built on the moor. There, he meets a beautiful French woman, Miss Eva Cameron, which warns him about the danger of living in such an isolated place. A few days later, his cottage is finished and he settles. He receives a quick visit from a neighbor nicknamed "The Surgeon of Gaster Fell" which leaves him with a dubious feeling. Then a few days later Upperton decides to visit him. Not far from his house, he sees his neighbor beating a poor old man. He decides to learn more and, without being seen, he throws an eye in the house. He sees a cage where the poor man is held prisoner. A few days later, the same old man escapes and tries to enter in Upperton's cotttage, but he is catched up by the surgeon. All these strange events are explained in a letter Upperton receives shortly after. It is written by his curious neighbor,who is none other than the brother of Eva Cameron. He explains that his old father is suffering from insanity and he tries by any means to avoid him to be interned in a psychiatric hospital. Source : Chambers's Journal, december 1890. Later collected versions are abbreviated. Bleak and wind-swept is the little town of Kirkby-Malhouse, and harsh and forbidding are the fells upon with it stands. It stretches in a single line of grey-stone, slate-roofed houses, dotted down the furze-clad slope of the rolling moor. To the north and south stretch the swelling curves of the Yorkshire uplands, peeping over each other's backs to the skyland, with a tinge of yellow in the foreground, which shades away to olive in the distance, save where the long grey scars of rock protrude through the scanty and barren soil. From the little barren knoll above the church one may see to the westward a fringe of gold upon an arc of silver, where the great Morecambe sands are washed by the Irish Sea. To the east, Ingleborough looms purple in the distance; while Pennigent shoots up the tapering peak, whose great shadow, like Nature's own sun-dial, sweeps slowly around over a vast expanse of savage and sterile country. In this lonely and secluded village, I, James Upperton, found myself in the summer of '85. Little as the hamlet had to offer, it contained that for which I yearned above all things — seclusion and freedom from all which might distract my mind from the high and weighty subjects which engaged it. I was weary of the long turmoil and profitless strivings of life. From early youth my days had been spent in wild adventure and strange experiences, until at the age of thirty-nine there were few lands upon which I had not set foot, and scarcely any joy or sorrow of which I had not tasted. Among the first of Europeans, I had penetrated to the shores of Lake Tanganyika; I had twice made my way to those unvisited and impenetrable jungles which skirt the great table-land of Roraima. As a soldier of fortune I had served under many flags. I was with Jackson in the Shenandoah Valley; and I fought with Chanzy in the army of the Loire. It may well seem strange that, after a life so exciting, I could give myself up to the dull routine and trivial interests of the West Riding hamlet. And yet there are excitements of the mind to which mere bodily peril or the exaltation of travel is mean and commonplace. For years I had devoted myself to the study of the mystic and hermetic philosophies, Egyptian, Indian, Grecian and medieval, until out of the vast chaos there had dimly dawned upon me a huge symmetrical design; and I seemed to grasp the key of that symbolism which was used by those learned men to screen their precious knowledge from the vulgar and the wicked. Gnostics and Neo-platonists, Chaldeans, Rosicrucians, and Indian Mystics, I saw and understood in which each played a part. To me the jargon of Paracelcus, the mysteries of the alchemists, and the visions of the Swedenborg were all pregnant with meaning. I had deciphered the mysterious inscriptions of El Biram: and I knew the import of those strange characters which have been engraved by an unknown race upon the cliffs of Southern Turkestan. Immersed in these great and engrossing studies, I asked nothing from life save a garret for myself and my books, where I might pursue my studies without interference or interruption. But even in this little moorside village I found that it was impossible to shake off the censorship of one's fellow-mortals. When I went forth, the rustics would eye me askance, and mothers would ship up their children as I passed down the village street. At night I have glanced through my diamond-paned lattice to find that a group of foolish, staring peasants had been craning their necks in an ecstasy of fear and curiosity to watch me at my solitary task. My landlady also, became garrulous with a clatter of questions under every small pretext, and a hundred small ruses and wiles by which to tempt me to speak to her of myself and of my plans. All this was ill to bear; but when at last I heard that I was no longer to be sole lodger, and that a lady, a stranger, had engaged the other room, I felt that indeed it was time for one who sought the quiet and the peace of study to seek more tranquil surrounding. In my frequent walks I had learned to know well the wild and desolate region where Yorkshire borders on both Lancashire and Westmorland. From Kirkby-Malhouse I had frequently made my way to this lonesome wilderness, and had traversed it from end to end. In the gloomy majesty of its scenery, and the appalling stillness and loneliness of its rock-strewn, melancholy solitudes, it seemed to offer me a secure asylum from espionage and criticism. As it chanced, I had in one of my rambles come upon an isolated dwelling in the very heart of these lonely moors, which I at once determined should be my own. It was a two-roomed cottage, which had once belonged to some shepherd, but had long been deserted, and was crumbling rapidly to ruin. In the winter floods, the Gaster Beck, which runs down Gaster Fell, where the little shieling stood, had overswept it's banks and torn away a part of the wall. The roof too was in ill cases, and the scattered slates lay thick amongst the grass. Yet the main shell of the house stood firm and true; and it was no great task for me to have all that was amiss set right. Though not rich, I could afford to carry out so modest a whim in a lordly way. There came slaters and masons from Kirkby-Malhouse, and soon the lonely cottage upon Gaster Fell was as strong and weather-tight as ever. The two rooms I laid out in a widely different manner — my own tastes are of a Spartan turn, and the outer chamber was so planned as to accord with them. An oil – stove by Rippingille of Birmingham furnished me with the means of cooking; while two great bags, the one of flour, and the other of potatoes, made me independent of all supplies from without. In diet I had long been a Pythagorean, so that the scraggy, long-limbed sheep which browsed upon the wiry grass by the Gaster Beck had little to fear from their new companion. A nine-gallon cask of oil served me as a sideboard; while a square table, a deal chair and a truckle-bed completed the list of my domestic fittings. At the head of my couch hung two unpainted shelves — the lower for my dishes and cooking utensils, the upper for the few portraits which took me back to the little that was pleasant in the long, wearisome toiling for wealth and for pleasure which had marked the life I had left behind. If this dwelling-room of mine were plain even to squalor, it's poverty was more than atoned for by the luxury of the chamber which was destined to serve as my study. I had ever held that it was best for my mind to be surrounded by such objects as would be in harmony with the studies which occupied it, and that the loftiest and most ethereal conditions of thought are only possible amid surroundings which please the eye and gratify the senses. The room which I had set apart for my mystic studies was set forth in a style as gloomy and majestic as the thoughts and aspirations with which it was to harmonise. Both walls and ceilings were covered with a paper of the richest and glossiest black, on which was traced a lurid and arabesque pattern of dead gold. A black velvet curtain covered the single diamond-paned window; while a thick yielding carpet of the same material prevented the sound of my own footfalls, as I paced backwards and forward, from breaking the current of my thought. Along the cornices ran gold rods, from which depended six pictures, all of the sombre and imaginative caste, which chimed best with my fancy. Two, as I remember, were from the brush of Fuseli; one from Noel??? ; one from Gustave Dore; two from Martin; with a little water colour from the incomparable Blake. From the centre of the ceiling hung a single gold thread, so thin as to be scarce visible, but of great toughness. From this swung a dove of the same metal, with wings out-stretched. The bird was hollow, and contained perfumed oil; while a sylph-like figure, curiously fashioned from pink crystal, hovered over the lamp, and imparted a soft and rich glow to the light. A brazen fireplace backed with malachite, two tiger skins upon the carpet, a buhl table, and two reclining chairs in amber plush and ebony, completed the furniture of my bijou study, save that under the window stretched the long book shelves, which contained the choicest works of those who have busied themselves with mystery of life. Boehme, Swedenborg, Damton, Berto, Lacci, Sinnett, Hardinge, Britten, Dunlop, Amberley, Winwood Read, Des Mousseaux, Alan Karcec, Lepsius, Sepher, Toldo, and the Abbe Dubois – these were some of those who stood marshalled between my oaken shelves. When the lamp was lighted of a night and the lurid, flickering light played over the sombre and bizarre surroundings, the effect was all that I could wish. Nor was it lessened by the howling of the wind as it swept over the melancholy waste around me. Here at last, I thought is a black-eddy in life's hurried stream, where I may lie in peace, forgetting and forgotten. And yet it was destined that ere ever I reached this quiet Harbour I should learn that I was still one of humankind, and that it is an ill thing to strive to break the bond which binds us to our fellows. It was but two nights before the date I had fixed upon for my change of dwelling, when I was conscious of a bustle in the house beneath, with the bearing of heavy burdens up the creaking stair, and the harsh voice of my landlady, loud in welcome and protestations of joy. From time to time, amid the whirl of words, I could hear a gentle and softly modulated voice, which struck pleasantly upon my ear after the long weeks during which I had listened only to the rude dialect of the dalesman. For an hour I could hear the dialogue beneath — the high voice and the low, with clatter of cup and clink of spoon, until at last a light, quick step passed my study door, and I knew that my fellow lodger had sought her room. Already my fears had been fulfilled, and my studies the worse for her coming. I vowed in my mind that the second sunset should find me installed, safe from all such petty influences, in my sanctuary at Gaster Fell. On the morning after this incident I was up betimes, as is my wont; but I was surprised, on glancing from my window, to see that our new inmate was earlier still. She was walking down the narrow pathway, which zigzags over the fell — a tall woman, slender, her head sunk upon her breast, her arms filled with a bristle of wild flowers, which she had gathered in her morning rambles. The white and pink of her dress, and the touch of deep red ribbon in her broad drooping hat, formed a pleasant dash of colour against the dun-tinted landscape. She was some distance off when I first set eyes upon her, yet I knew that this wandering woman could be none other than our arrival of last night, for there was a grace and refinement in her bearing which marked her from the dwellers of the fells. Even as I watched, she passed swiftly and lightly down the pathway, and turning through the wicket gate, at the further end of our cottage garden, she seated herself upon the green bank which faced my window, and strewing her flowers in front of her, set herself to arrange them. As she sat there, with the rising sun at her back, and the glow of the morning spreading like an aureole around her stately and well-poised head, I could see that she was a woman of extraordinary personal beauty. Her face was Spanish rather than English in it's type — oval, olive, with black, sparkling eyes, and a sweetly sensitive mouth. From under the broad straw hat two thick coils of blue-black hair curved down on either side of her graceful, queenly neck. I was surprised, as I watched her, to see that her shoes and skirt bore witness to a journey rather than to a mere morning ramble. Her light dress was stained, wet and bedraggled; while her boots were thick with the yellow soil of the fells. Her face too, wore a weary expression, and her young beauty seemed to be clouded over by the shadow of inward trouble. Even as I watched her, she burst suddenly into wild weeping, and throwing down her bundle of flowers ran swiftly into the house. Distrait as I was and weary of the ways of the world, I was conscious of a sudden pang of sympathy and grief as I looked upon the spasm of despair which, seemed to convulse this strange and beautiful woman. I bent to my books, and yet my thoughts would ever turn to her proud clear-cut face, her weather-stained dress, her drooping head, and the sorrow which lay in each line and feature of her pensive face. Mrs. Adams, my landlady, was wont to carry up my frugal breakfast; yet it was very rarely that I allowed her to break the current of my thoughts, or to draw my mind by her idle chatter from weightier things. This morning, however, for once, she found me in a listening mood, and with little prompting, proceeded to pour into my ears all that she knew of our beautiful visitor. "Miss Eva Cameron be her name, sir," she said: "but who she be, or where she came fra, I know little more than yoursel'. Maybe it was the same reason that brought her to Kirkby-Malhouse as fetched you there yoursel', sir." "Possibly," said I, ignoring the covert question; "but I should hardly have thought that Kirkby-Malhouse was a place which offered any great attractions to a young lady." "Heh, sir!" she cried, "there's the wonder of it. The leddy has just come fra France; and how her folk come to learn of me is just a wonder. A week ago, up comes a man to my door — a fine man, sir, and a gentleman, as one could see with half an eye. 'You are Mrs. Adams,' says he. 'I engage your rooms for Miss Cameron,' says he. 'She will be here in a week,' says he; and then off without a word of terms. Last night there comes the young leddy hersel' — soft spoken and downcast, with a touch of the French in her speech. But my sakes, sir! I must away and mak' her some tea, for she'll feel lonesome-like, poor lamb, when she wakes under a strange roof." I was still engaged upon my breakfast when I heard the clatter of dishes and the landlady's footfall as she passed toward her new lodger's room. An instant afterward she had rushed down the passage and burst in upon me with uplifted hand and startled eyes. "Lord 'a mercy, sir!" she cried, "and asking your pardon for troubling you, but I'm feared o' the young leddy, sir; she is not in her room." "Why, there she is," said I, standing up and glancing through the casement. "She has gone back for the flowers she left upon the bank." "Oh, sir, see her boots and her dress!" cried the landlady, wildly. "I wish her mother was here, sir — I do. Where she has been is more than I ken, but her bed has not been lain on this night." "She has felt restless, doubtless, and went for a walk, though the hour was certainly a strange one." Mrs. Adams pursed her lip and shook her head. But then as she stood at the casement, the girl beneath looked smilingly up at her and beckoned to her with a merry gesture to open the window. "Have you my tea there?" she asked in a rich, clear voice, with a touch of the mincing French accent. "It is in your room, miss." "Look at my boots, Mrs Adams!" she cried, thrusting them out from under her skirt. "These fells of yours are dreadful places — effroyable — one inch, two inch; never have I seen such mud! My dress, too — voila!" "Eh, miss, but you are in a pickle," cried the landlady, as she gazed at the bedraggled gown. "But you must be main weary and heavy for sleep." "No, no," she answered, laughingly, "I care not for sleep. What is sleep? It is a little death — voila tout. But for me to walk, to run, to breathe the air — that is to live. I was not tired, and so all night I have explored these fells of Yorkshire." "Lord 'a mercy, miss, and where did you go?" asked Mrs Adams. She waved her hand round in a sweeping gesture which included the whole western horizon. "There," she cried. "O comme ells sont tristes et sauvages, ces collines! But I have flowers here. You will give me water, will you not? They will wither else." She gathered her treasures in her lap, and a moment later we heard her light, springy footfall upon the stair. So she had been out all night, this strange woman. What motive could have taken her from her snug room on to the bleak, wind-swept hills? Could it be merely the restlessness, the love of adventure of a young girl? Or was there, possibly, some deeper meaning in this nocturnal journey? I thought, as I paced my chamber, of her drooping head, the grief upon her face, and the wild burst of sobbing which I had overseen in the garden. Her nightly mission, then be it what it might, had left no thought of pleasure behind it. And yet, even as I walked, I could hear the merry tinkle of her laughter and her voice upraised in protest against the motherly care wherewith Mrs. Adams insisted upon her changing her mud-stained garments. Deep as were the mysteries which my studies had taught me to solve, here was a human problem which for the moment at least was beyond my comprehension. I had walked out on the moor in the forenoon, and on my return, as I topped the brow that overlooks the little town, I saw my fellow-lodger some little distance off among the gorse. She had raised a light easel in front of her, and with papered board laid across it, was preparing to paint the magnificent landscape of rock and moor which stretched away in front of her. As I watched her I saw that she was looking anxiously to right and left. Close by me a pool of water had formed in a hollow. Dipping the cup of my pocket-flask into it, I carried it across to her. "This is what you need, I think," said I, raising my cap and smiling. "Merci bien!" she answered, pouring the water into her saucer, "I was indeed in search of some." "Miss Cameron, I believe," said I. "I am your fellow-lodger. Upperton is my name. We must introduce ourselves in these wilds if we are not to be for ever strangers." "Oh, then, you live also with Mrs. Adams!" she cried. "I had thought that there were none but peasants in this strange place." "I am a visitor, like yourself," I answered. "I am a student, and have come for quiet and repose, which my studies demand." "Quiet, indeed!" said she, glancing around at the vast circle of silent moors, with the one tiny line of grey cottages which sloped down beneath us. "And yet not quiet enough," I answered, laughing, "for I have been forced to move further into the fells for the absolute peace which I require." "Have you, then built a house upon the fells?" she asked, arching her eyebrows. "I have, and hope within a few days to occupy it." "Ah, but that is triste," she cried. "And where is it, then, this house which you have built?" "It is over yonder," I answered. "See that stream which lies like a silver band upon the distant moor? It is the Gaster Beck, and it runs through Gaster Fell." She started, and turned upon me her great dark, questioning eyes with a look in which surprise, incredulity, and something akin to horror seemed to be struggling for mastery. "And you will live on the Gaster Fell?" she cried. "So I have planned. But what do you know of Gaster Fell, Miss Cameron?" I asked. "I had thought that you were a stranger in these parts." "Indeed, I have never been here before," she answered. "But I have heard my brother talk of these Yorkshire moors; and, if I mistake not, I have heard him name this very one as the wildest and most savage of them all." "Very likely," said I, carelessly. "It is indeed a dreary place." "Then why live there?" she cried, eagerly. "Consider the loneliness, the barrenness, the want of all comfort and of all aid, should aid be needed." "Aid! What aid should be needed on Gaster Fell?" She looked down and shrugged her shoulders. "Sickness may come in all places," said she. "If I were a man I do not think I would live alone on Gaster Fell." "I have braved worse dangers than that," said I, laughing; "but I fear that your picture will be spoiled, for the clouds are banking up, and already I feel a few raindrops." Indeed, it was high time we were on our way to shelter, for even as I spoke there came the sudden, steady swish of the shower. Laughing merrily, my companion threw her light shawl over her head, and seizing picture and easel, ran with the lithe grace of a young fawn down the furze-clad slope, while I followed after with camp-stool and paint-box. Deeply as my curiosity had been aroused by this strange waif which had been cast up in our West Riding hamlet, I found that with fuller knowledge of her my interest was stimulated rather than satisfied. Thrown together as we were, with no thought in common with the good people who surrounded us,it was not long before a friendship and confidence arose between us. Together we strolled over the moors in the mornings, or stood upon the Moorstone Crag to watch the red sun sinking beneath the distant waters of Morecambe. Of herself she spoke frankly and without reserve. Her mother had died young, and her youth had been spent in the Belgian convent from which she had just finally returned. Her father and one brother, she told me, constituted the whole of her family. Yet, when the talk chanced to turn upon the causes which had brought her to so lonely a dwelling, a strange reserve possessed her, and she would either relapse into silence or turn the talk into another channel. For the rest, she was an admirable companion – sympathetic, well read, with the quick, piquant daintiness of thought which she had brought with her from her foreign training. Yet the shadow which I had observed in her on the first morning that I had seen her was never far from her mind, and I have seen her merriest laugh frozen suddenly upon her lips, as though some dark thought lurked within her, to choke down the mirth and gaiety of her youth. It was the eve of my departure from Kirkby-Malhouse that we sat upon the green bank in the garden, she with dark dreamy eyes looking sadly out over the sombre fells; while I, with a book upon my knee, glanced covertly at her lovely profile and marvelled to myself how twenty years of life could have stamped so sad and wistful an expression upon it. "You have read much," I remarked at last. "Women have opportunities now such as their mothers never knew. Have you ever thought of going further — or seeking a course of college or even a learned profession?" She smiled wearily at the thought. "I have no aim, no ambition," she said. "My future is black — confused — a chaos. My life is like to one of these paths upon the fells. You have seen them, Monsieur Upperton. They are smooth and straight and clear where they begin; but soon they wind to left and wind to right, and so mid rocks and crags until they lose themselves in some quagmire. At Brussels my path was straight; but now, mon Dieu! Who is there can tell me where it leads?" "It might take no prophet to do that, Miss Cameron," quoth I, with the fatherly manner which two score years may show toward one. "If I may read your life, I would venture to say that you were destined to fulfil the lot of women — to make some good man happy, and to shed around, in some wider circle, the pleasure which your society has given me since first I knew you." "I will never marry," said she, with a sharp decision, which surprised and somewhat amused me. "Not marry — and why?" A strange look passed over her sensitive features, and she plucked nervously at the grass on the bank beside her. "I dare not," said she in a voice that quivered with emotion. "It is not for me. I have other things to do. That path of which I spoke is one which I must tread alone." "But this is morbid," said I. "Why should your lot, Miss Cameron, be separate from that of my own sisters, or the thousand other young ladies whom every season brings out into the world? But perhaps it is that you have a fear and distrust of mankind. Marriage brings a risk as well as a happiness." "The risk would be with the man who married me," she cried. And then in an instant, as though she had said too much, she sprang to her feet and drew her mantle round her. "The night air is chill, Mr Upperton," said she, and so swept swiftly away, leaving me to muse over the strange words which had fallen from her lips. I had feared that this woman's coming might draw me from my studies, but never had I anticipated that my thoughts and interests could have been changed in so short a time. I sat late that night in my little study, pondering over my future course. She was young, she was fair, she was alluring, both from her own beauty and from the strange mystery that surrounded her. And yet what was she, that she should turn me from the high studies that filled my mind, or change me from the line of life which I had marked out for myself? I was no boy, that I should be swayed or shaken by a dark eye or a woman's smile, and yet three days had passed but my work lay where I had left it. Clearly, it was time that I should go. I set my teeth and vowed that another day should not have passed before I should have snapped this newly formed tie and sought the lonely retreat which awaited me upon the moors. Breakfast was hardly over in the morning before a peasant dragged up to the door the rude hand-cart which was to convey my few personal belongings to my new dwelling. My fellow-lodger had kept her room; and, steeled as my mind was against her influence, I was yet conscious of a little throb of disappointment that she should allow me to depart without a word of farewell. My hand-cart with its load of books had already started, and I, having shaken hands with Mrs. Adams, was about to follow it, when there was a quick scurry of feet on the stair, and there she was beside me all panting with her own haste. "Then you go — you really go?" said she. "And to Gaster Fell?" she asked. "Yes; to the cottage which I have built there." "And you will live alone there?" "With my hundred companions who lie in that cart." "Ah, books!" she cried, with a pretty shrug of her graceful shoulders. "But you will make me a promise?" "What is it?" I asked, in surprise. "It is a small thing. You will not refuse me?" "You have but to ask it." She bent forward her beautiful face with an expression of the most intense earnestness. "You will bolt your door at night?" said she; and was gone ere I could say a word in answer to her extraordinary request. It was a strange thing for me to find myself at last duly installed in my lonely dwelling. For me, now, the horizon was bounded by the barren circle of wiry, unprofitable grass, patched over with furze bushes and scarred by the profusion of Nature's gaunt and granite ribs. A duller, wearier waste I have never seen; but it's dullness was its very charm. What was there in the faded, rolling hills, or in the blue, silent arch of heaven to distract my thoughts from the high thoughts which engrossed them? I had left the drove of mankind, and had wandered away, for better or worse, upon a side path of my own. With them I had hoped to leave grief, disappointment, and emotion, and all other petty human weaknesses. To live for knowledge, and knowledge alone, that was the highest aim which life could offer. And yet the very first night which I spent at Gaster Fell there came a strange incident to lead my thoughts back once more to the world which I had left behind me. It had been a sullen and sultry evening, with great livid cloud-banks mustering in the west. As the night wore on, the air within my little cabin became closer and more oppressive. A weight seemed to rest upon my brow and my chest. From far away the low rumble of thunder came moaning over the moor. Unable to sleep, I dressed, and standing at my cottage door, looked on the black solitude which surrounded me. There was no breeze below; but above, the clouds were sweeping majestically across the sky, with half a moon peeping at times between the rifts. The ripple of the Gaster Beck and the dull hooting of a distant owl were the only sounds which broke upon my ear. Taking the narrow sheep path which ran by this stream, I strolled along it for some hundred yards, and had turned to retrace my steps, when the moon was finally buried beneath an ink-black cloud, and the darkness deepened so suddenly that I could see neither the path at my feet, the stream upon my right, nor the rocks upon my left. I was standing groping about in the thick gloom, when there came a crash of thunder with a flash of lightning which lighted up the whole vast fell, so that every bush and rock stood out clear and hard in the vivid light. It was but for an instant, and yet that momentary view struck a thrill of fear and astonishment through me, for in my very path, not twenty yards before me, there stood a woman, the livid light beating upon her face and showing up every detail of her dress and features. There was no mistaking those dark eyes, that tall, graceful figure. It was she — Eva Cameron, the woman whom I thought I had forever left. For an instant I stood petrified, marvelling whether this could indeed be she, or whether it was some figment conjured up by my excited brain. Then I ran swiftly forward in the direction where I had seen her, calling loudly upon her, but without reply. Again I called, and again no answer came back, save the melancholy wail of the owl. A second flash illuminated the landscape, and the moon burst out from behind its cloud. But I could not, though I climbed upon a knoll which overlooked the whole moor, see any sign of this strange midnight wanderer. For an hour or more I traversed the fell, and at last found myself back at my little cabin, still uncertain as to whether it had been a woman or a shadow upon which I gazed. For the three days which followed this midnight storm, I bent myself doggedly to my work. From early morn till late at night. I immersed myself in my books and my parchments. At last it seemed to me that I had reached that haven of rest, that oasis of study for which I had so often sighed. But, alas for my hopes and my plannings! Within a week of my flight from Kirkby-Malhouse a strange and most unforeseen series of events not only broke in upon the calm of my existence, but filled me with emotions so acute as to drive all other considerations from my mind. It was either on the fourth or the fifth day after I had taken possession of my cottage that I was astonished to hear footsteps on the grass outside, quickly followed by a crack, as from a stick, upon the door. The explosion of an infernal machine would hardly have surprised or discomfited me more. I had hoped to have shaken off all intrusion forever, yet here was somebody beating at my door with as little ceremony as if it had been a village ale-house. Hot with anger, I flung down my book and withdrew the bolt, just as my visitor had raised his stick to renew his rough application for admittance. He was a tall, powerful man, tawny-bearded and deep-chested, clad in a loose-fitting suit of tweed, cut for comfort rather than elegance. As he stood in the shimmering sunlight, I took in every feature of his face. The large fleshy nose; the steady blue eyes, with their thick thatch of overhanging brows; the broad forehead, all knitted and lined with furrows, which were strangely at variance with his youthful bearing. In spite of his weather-stained felt hat, and the coloured handkerchief slung round his muscular brown neck, I could see at a glance he was a man of breeding and education. I had been prepared for some wandering shepherd or uncouth tramp, but this apparition fairly disconcerted me. "You look astonished," said he, with a smile. "Did you think, then, that you were the only man in the world with a taste for solitude? You see that there are other hermits in the wilderness besides yourself." "Do you mean to say that you live here?" I asked in no conciliatory voice. "Up yonder," he answered, tossing his head backward. "I thought as we were neighbours, Mr Upperton, that I could not do less than look in and see if I can assist you in any way." "Thank you," said I, coldly, standing with my hand upon the latch of the door. "I am a man of simple tastes, and you can do nothing for me. You have the advantage of me in knowing my name." He appeared to be chilled by my ungracious manner. "I learned it from the masons who were at work here," he said. "As for me, I am a surgeon, the surgeon of Gaster Fell. That is the name I have gone by in these parts, and it serves as well as another." "Not much room for practice here?" I observed. "Not a soul except yourself for miles on either side." "You appear to have had need of some assistance yourself?" I remarked, glancing at a broad white splash, as from the recent action of some powerful acid, upon his sunburnt cheek. "That is nothing," he answered, curtly, turning his face half round to hide the mark. "I must get back, for I have a companion who is waiting for me. If I can ever do anything for you, pray let me know. You only have to follow the beck upward for a mile or so to find my place. Have you a bolt on the inside of your door?" "Yes," I answered, rather startled at his question. "Keep it bolted then," he said. "The fell is a strange place. You never know who may be about. It is as well to be on the safe side. Good-bye." He raised his hat, turned on his heel, and lounged away along the bank of the little stream. I was still standing with my hand upon the latch, gazing after my unexpected visitor, when I became aware of yet another dweller in the wilderness. Some distance along the path which the stranger was taking there lay a great grey boulder, and leaning against this was a small, wizened man, who stood erect as the other approached, and advanced to meet him. The two talked for a minute or more, the taller man nodding his head frequently in my direction, as though describing what had passed between us. Then they walked on together, and disappeared in a dip of the fell. Presently I saw them ascending once more some rising ground further on. My acquaintance had thrown his arm round his elderly friend, either from affection or from a desire to aid him up the steep incline. The square, burly figure and its shrivelled meagre companion stood out against the sky-line, and, turning their faces, they looked back at me. At the sight, I slammed the door, lest they should be encouraged to return. But when I peeped from the window some minutes afterward, I perceived that they were gone. For the remainder of that day I strove in vain to recover that indifference to the world and its ways which is essential to mental abstraction. Do what I would, my thoughts ran upon the solitary surgeon and his shrivelled companion. What did he mean by his question as to my bolt? And how came it that the last words of Eva Cameron were to the same sinister effect. Again and again I speculated as to what train of causes could have led two men as dissimilar in age and appearance to dwell together on the wild inhospitable fells. Were they, like myself, immersed in some engrossing study? Or could it be that a companionship in crime had forced them from the haunts of men? Some cause there must be, and that a potent one, to induce the man of education to turn to such an existence. It was only now that I began to realise that the crowd of the city is infinitely less disturbing than the unit of the country. All day I bent over the Egyptian papyrus upon which I was engaged; but neither the subtitle reasonings of the ancient philosopher of Memphis, nor the mystic meaning which lay in his pages, could raise my mind from the things of earth. Evening was drawing in before I threw my work aside in despair. My heart was bitter against this man for his intrusion. Standing by the beck which purled past the door of my cabin, I cooled my heated brow, and thought the matter over. Clearly it was the small mystery hanging over these neighbours of mine which had caused my mind to run so persistently on them. That cleared up, they would no longer cause an obstacle to my studies. What was to hinder me, then, from walking in the direction of their dwelling, and observing for myself, without permitting them to suspect my presence, what manner of men they might be? Doubtless, their mode of life would be found to admit of some simple and prosaic explanation. In any case, the evening was fine and a walk would be bracing for mind and body. Lighting my pipe, I set off over the moors in the direction which they had taken. The sun lay low and red in the west, flushing the heather with a deeper pink, and mottling the broad heaven with every hue, from the palest green at the zenith, to the richest crimson along the fair horizon. It might have been the great palette upon which the world-painter had mixed his primeval colours. On either side, the giant peaks of Ingleborough and Pennigent looked down upon the grey, melancholy country which stretches between them. As I advanced, the rude fells ranged themselves upon right and left, forming a well-defined valley, down the centre of which meandered the little brooklet. On either side, parallel lines of grey rock marked the level of some ancient glacier, the moraine of which had formed the broken ground about my dwelling. Ragged boulders, precipitous scarps, and twisted fantastic rocks, all bore witness to the terrible power of the old ice-field, and showed where its frosty fingers had ripped and rent the solid limestones. About half-way down this wild glen there stood a small clump of gnarled and stunted oak-trees. From behind these, a thin dark column of smoke rose into the still evening air. Clearly this marked the position of my neighbour's house. Trending away to the left, I was able to gain the shelter of a line of rocks, and so reach a spot from which I could command a view of the building without exposing myself to any risk of being observed. It was a small, slate-covered cottage, hardly larger than the boulders among which it lay. Like my own cabin, it showed signs of having been constructed for the use of some shepherd; but; unlike mine, no pain had been taken by the tenants to improve and enlarge it. Two little peeping windows, a cracked and weather-beaten door, and a discoloured barrel for catching the rain-water, were the only external objects from which I might draw deductions as to the dwellers within. Yet even in these there was food for thought; for as I drew nearer, still concealing myself behind the ridge, I saw that thick bars of iron covered the windows, while the old door was slashed and plated with the same metal. These strange precautions, together with the wild surroundings and unbroken solitude, gave an indescribably ill omen and fearsome character to the solitary building. Thrusting my pipe into my pocket, I crawled upon my hands and knees through the gorse and ferns until I was within a hundred yards of my neighbour's door. There, finding that I could not approach nearer without fear of detection, I crouched down, and set myself to watch. I had hardly settled into my hiding-place, when the door of the cottage swung open, and the man who had introduced himself to me as the surgeon of Gaster Fell came out, bareheaded, with a spade in his hands. In front of the door there was a small cultivated patch containing potatoes, peas, and other forms of green stuff, and here he proceeded to busy himself, trimming, weeding, and arranging, singing the while in a powerful, though not very musical voice. He was all engrossed in his work, with his back to the cottage, when there emerged from the half-open door the same attenuated creature whom I had seen in the morning. I could perceive now that he was a man of sixty, wrinkled, bent and feeble, with sparse, grizzled hair, and long, colourless face. With a cringing, sidelong gait, he shuffled toward his companion, who was unconscious of his approach until he was close upon him. His light footfall or his breathing may have finally given notice of his proximity, for the worker swung round and faced him. Each made a quick step toward the other, as though in greeting, and then – even now I feel the horror of the instant – the tall man rushed upon and knocked his companion to the earth, then whipping up his body, ran with great speed over the intervening ground and disappeared with his burden into the house. Case-hardened as I was by my varied life, the suddenness and violence of the thing made me shudder. The man's age, his feeble frame, his humble and deprecating manner, all cried shame against the deed. So hot was my anger, that I was on the point of striding up to the cabin, unarmed as I was, when the sound of voices from within showed me that the victim had recovered. The sun had sunk beneath the horizon, and all was grey, save a red feather in the cap of Pennigent. Secure in the failing light, I approached near and strained my ears to catch what was passing. I could hear the high, querulous voice of the elder man, mixed with a strange metallic jangling and clanking. Presently the surgeon came out, locking the door behind him, and stamped up and down in the twilight, pulling his hair and brandishing his arms, like a man demented. Then he set off, walking rapidly up the valley, and I soon lost sight of him among the rocks. When the sound of his feet had died away in the distance, I drew nearer to the cottage. The prisoner within was still pouring forth a stream of words, and moaning from time to time, like a man in pain. These words resolved themselves, as I approached, into prayers – shrill, voluble prayers, pattered forth with the intense earnestness of one who sees impending an imminent danger. There was to me something inexpressibly awesome in this gush of solemn entreaty from the lonely sufferer, meant for no human ear, and jarring upon the silence of the night. I was still pondering whether I should mix myself in the affair or not, when I heard in the distance the sound of the surgeon's returning footfall. At that I drew myself up quickly by the iron bars and glanced in through the diamond-pane window. The interior of the cottage was lighted up by a lurid glow, coming from what I afterward discovered to be a chemical furnace. By it's rich light, I could distinguish a great litter of retorts, test-tubes, and condensers, which sparkled over the table, and threw strange grotesque shadows on the wall. On the further side of the room was a wooden frame-work resembling a hencoop, and in this, still absorbed in prayer, knelt the man whose voice I heard. The red glow beating upon his upturned face made it stand out from the shadows like a painting from Rembrandt, showing up every wrinkle upon the parchment-like skin. I had but time for a fleeting glance; then dropping from the window I made off through the rocks and the heather; nor slackened my pace until I found myself back in my calm once more. There I threw myself upon my couch, more disturbed and shaken than I had ever thought to feel again. Long into the watches of the night I tossed and tumbled on my uneasy pillow. A strange theory had framed itself within me, suggested by the elaborate scientific apparatus which I had seen. Could it be that this surgeon had some profound and unholy experiments on hand, which necessitated the taking, or at least the tampering with the life of his companion? Such a supposition would account for the loneliness of his life; but how could I reconcile it with the close friendship which had appeared to exist between the pair no longer ago than that very morning? Was it grief or madness which had made the man tear his hair and wring his hands when he emerged from the cabin? And sweet Eva Cameron, was she also a partner to this sombre business? Was it to my grim neighbours that she made her strange nocturnal journeys? And if so, what bond could there be to unite so strangely assorted a trio? Try as I might, I could come to no satisfactory conclusion upon these points. When at last I dropped into a troubled slumber, it was only to see once more in my dreams the strange episodes of the evening, and to wake at dawn unrefreshed and weary. Such doubts as I might have had as to whether I had indeed seen my former fellow-lodger upon the night of the thunder-storm, were finally resolved that morning. Strolling along down the path which led to the fell, I saw in one spot where the ground was soft the impressions of a foot – the small dainty foot of a well-booted woman. That tiny heel and high instep could have belonged to none other than my companion of Kirkby-Malhouse. I followed her trail for some distance till it lost itself among hard and stony ground; but it still pointed, as far as I could discern it, to the lonely and ill-omened cottage. What power could there be to draw this tender girl, through wind and rain and darkness, across the fearsome moors to that strange rendezvous? But why should I let my mind run upon such things? Had I not prided myself that I lived a life of my own, beyond the sphere of my fellow-mortals? Were all my plans and my resolutions to be shaken because the ways of my neighbours were strange to me? It was unworthy, it was puerile. By constant and unremitting effort, I set myself to cast out these distracting influences, and to return to my former calm. It was no easy task. But after some days, during which I never stirred from my cottage, I had almost succeeded in regaining my peace of mind, when a fresh incident whirled my thoughts back into their old channel. I had said that a little beck flowed down the valley and past my very door. A week or so after the doings which I had described, I was seated by my window, when I perceived something white drifting slowly down the stream. My first thought was that it was a drowning sheep; but picking up my stick, I strolled to the bank and hooked it ashore. On examination it proved to be a large sheet, torn and tattered, with the initials J.C. in the corner. What gave it its sinister significance, however, was that from hem to hem it was all dabbled and dis-coloured with blood. In parts where the water had soaked it, this was but a discolouration; while in others the stains showed they were of recent origin. I shuddered as I gazed at it. It could but have come from the lonely cottage in the glen. What dark and violent deed had left this gruesome trace behind it? I had flattered myself that the human family was as nothing to me, and yet my whole being was absorbed now in curiosity and resentment. How could I remain neutral when such things were doing within a mile of me? I felt that the old Adam was too strong in me, and that I must solve this mystery. Shutting the door of my cabin behind me, I set off up the glen in the direction of the surgeon's cabin. I had not gone far before I perceived the very man himself. He was walking rapidly along the hill-side, beating the furze bushes with a cudgel and bellowing like a madman. Indeed, at the sight of him, the doubts as to his sanity which had arisen in my mind were strengthened and confirmed. As he approached, I noticed that his left arm was suspended in a sling. On perceiving me, he stood irresolute, as though uncertain whether to come over to me or not. I had no desire for an interview with him, however; so I hurried past him, on which he continued on his way, still shouting and striking about with his club. When he had disappeared over the fells, I made my way down to his cottage, determined to find some clue to what had occurred. I was surprised, on reaching it, to find the iron-plated door swung wide open. The ground immediately outside it was marked with the signs of a struggle. The chemical apparatus within and the furniture were all dashed about and shattered. Most suggestive of all, the sinister wooden cage was stained with blood-marks, and its unfortunate occupant had disappeared. My heart was heavy for the little man, for I was assured I should never see him in this world more. There were many grey cairns of stones scattered over the valley. I ran my eye over them, and wondered which of them concealed the traces of this last act which ended the long tragedy. There was nothing in the cabin to throw any light upon the identity of my neighbours. The room was stuffed with chemicals and delicate philosophical instruments. In one corner, a small book-case contained a choice selection of works of science. In another was a pile of geological specimens collected from the limestone. My eye ran rapidly over these details; but I had no time to make a more thorough examination, for I feared lest the surgeon should return and find me there. Leaving the cottage I hastened homeward with a weight at my heart. A nameless shadow hung over the lonely gorge – the heavy shadow of unexpiated crime, making the grim fells look grimmer, and the wild moors more dreary and forbidding. My mind wavered whether I should send to Lancaster to acquaint the police of what I had seen. My thoughts recoiled at the prospect of becoming a witness in a cause celebre, and having an overbusy counsel or an officious press peeping and prying into my own mode of life. Was it for this I had stolen away from my fellow-mortals and settled in these lonely wilds? The thought of publicity was repugnant to me. It was best, perhaps, to wait and watch without taking any decided step until I had come to a more definite conclusion as to what I had heard. I caught no glimpse of the surgeon upon my homeward journey; but when I reached my cottage, I was astonished and indignant to find that somebody had entered it in my absence. Boxes had been pulled out from under the bed, the curtains disarranged, the chairs drawn out from the wall. Even my study had not been safe from this rough intruder, for the prints of a heavy boot were plainly visible on the ebony-black carpet. I am not a patient man at the best of times; but the invasion and systematic examination of my household effects stirred up every drop of gall in my composition. Swearing under my breath, I took my old cavalry sabre down from its nail and passed my finger along the edge. There was a great notch in the centre where it had jarred up against the collar-bone of a Bavarian artilleryman, the day we beat Van Der Tann back from Orleans. It was still sharp enough, however, to be serviceable. I placed it at the head of my bed, within reach of my arm, ready to give a keen greeting to the next uninvited visitor who might arrive. The night set in gusty and tempestuous, and the moon was all girt with ragged clouds. The wind blew in melancholy gusts, sobbing and sighing over the moor, and setting all the gorse-bushes agroaning. From time to time a little sputter of rain pattered up against the window-pane. I sat until near midnight glancing over the fragment on immortality by Iamblichus, the Alexandrian Platonist , of whom the Emperor Julian said that he was posterior to Plato in time, but not in genius. At last, shutting up my book, I opened my door and took a last look at the dreary fell and still more dreary sky. As I protruded my head, a swoop of wind caught me, and sent the red ashes of my pipe sparkling and dancing through the darkness. At the same moment the moon shone brilliantly out from between two clouds, and I saw, sitting on the hillside, not two hundred yards from my door, the man who called himself the surgeon of Gaster Fell. He was squatted among the heather, his elbows upon his knees, and his chin resting upon his hands, as motionless as a stone, with his gaze fixed steadily upon the door of my dwelling. At the sight of this ill-omened sentinel, a chill of horror and of fear shot through me, for his gloomy and mysterious associations had cast a glamour round the man, and the hour and place were in keeping with his sinister presence. In a moment, however, a manly glow of resentment and self-confidence drove this petty emotion from my mind, and I strode fearlessly in his direction. He rose as I approached, and faced me, with the moon shining on his grave bearded face and glittering on his eyeballs. "What is the meaning of this?" I cried as I came up on him. "What right have you to play the spy on me?" I could see the flush of anger rise on his face. "Your stay in the country has made you forget your manners," he said. "The moor is free to all." "You will say next that my house is free to all," I said hotly. "You have had the impertinence to ransack it in my absence this afternoon." He started, and his features showed the most intense excitement. "I swear to you that I had no hand in it," he cried. "I have never set foot in your house in my life. Oh sir, sir, if you will but believe me, there is a danger hanging over you, and you would do well to be careful." "I have had enough of you," I said. "I saw the coward blow you struck when you thought no human eye rested upon you. I have been to your cottage, too, and know all that it has to tell. If there is law in England, you shall hang for what you have done. As to me, I am an old soldier, sir, and I am armed. I shall not fasten my door. But if you or any other villain attempt to cross my threshold, it shall be at your own risk." With these words I swung round on my heel and strode into my cabin. When I looked back at him from the door he was still looking at me, a gloomy figure among the heather, with his head sunk low upon his breast. I slept fitfully all that night; but I heard no more of this strange sentinel without, nor was he to be seen when I looked out in the morning. For two days the wind freshened and increased with constant squalls of rain, until on the third night the most furious storm was raging which I can ever recollect in England. The thunder roared and rattled overhead, while the incessant lightning flashes illuminated the heavens. The wind blew intermittently, now sobbing away into a calm, and then, of a sudden, beating and howling at my window-pane until the glasses rattled in their frames. The air was charged with electricity, and it's peculiar influence, combined with the strange episodes with which I had been recently connected, made me morbidly wakeful and acutely sensitive. I felt that it was useless to go to bed, nor could I concentrate my mind sufficiently to read a book. I turned my lamp half-down to moderate the glare, and leaning back in my chair, I gave myself up to reverie. I must have lost all perception of time, for I have no recollection how long I sat there on the border-land betwixt thought and slumber. At last, about three or, possibly, four o'clock, I came to myself with a start – not only came to myself, but with every sense and nerve upon the strain. Looking round my chamber in the dim light, I could not see anything to justify my sudden trepidation. The homely room, the rain-blurred window, and the rude wooden door were all as they had been. I had begun to persuade myself that some half-formed dream had sent that vague thrill through my nerves, when in a moment I became conscious of what it was. It was a sound, the sound of a human step outside my solitary cottage. Amid the thunder and the rain and the wind, I could hear it – a dull stealthy footfall, now on the grass, now on the stones – occasionally stopping entirely, then resumed, and ever drawing nearer. I sat breathlessly, listening to the eerie sound. It had stopped by now at my very door, and was replaced by a panting and gasping, as of one who has travelled fast and far. Only the thickness of the door separated me from this hard-breathing, light-treading night-walker. I am no coward; but the wildness of the night, with the vague warning which I had had, and the proximity of this strange visitor, so unnerved me that my mouth was too dry for speech. I stretched out my hand, however, and grasped my sabre, with my eyes still bent upon the door. I prayed in my heart that the thing, whatever it might be, would but knock or threaten or hail me, or give any clue as to its character. Any known danger was better than this awful silence, broken only by the rhythmic panting. By the flickering light of the expiring lamp I could see that the latch of my door was twitching, as though a gentle pressure were exerted on it from without. Slowly, slowly, it rose, until it was free of the catch, and then there was a pause of a quarter minute or more, while I still sat silent, with dilated eyes and drawn sabre. Then, very slowly, the door began to revolve upon its hinges, and the keen air of the night came whistling through the slit. Very cautiously it was pushed open, so that never a sound came from the rusty hinges. As the aperture enlarged, I became aware of a dark shadowy figure upon my threshold, and of a pale face that looked in on me. The features were human, but the eyes were not. They seemed to burn through the darkness with a greenish brilliancy of their own; and in their baleful shifty glare I was conscious of the very spirit of murder. Springing from my chair, I had raised my naked sword, when, with a wild shouting, a second figure dashed up to my door. At its approach my shadowy visitant uttered a shrill cry, and fled away across the fells, yelping like a beaten hound. The two creatures were swallowed up in the tempest from which they had emerged as if they were the very genii of the beating wind and the howling rain. Tingling with my recent fear, I stood at my door, peering through the night with the discordant cry of the fugitives still ringing in my ears. At that moment a vivid flash of lightning illuminated the whole landscape and made it as clear as day. By its light, I saw, far away, upon the hillside, two dark figures pursuing each other with extreme rapidity across the fells. Even at that distance the contrast between them forbade all doubt as to their identity. The first was the small elderly man whom I had supposed to be dead; the second was my neighbour the surgeon. For an instant they stood out clear and hard in the unearthly light; in the next, the darkness had closed over them, and they were gone. As I turned to re-enter my chamber, my foot rattled against something on my threshold. Stooping, I found it was a straight knife, fashioned entirely of lead, and so soft and brittle that it was a strange choice for a weapon. To render it the more harmless, the top had been cut square off. The edge, however, had been assiduously sharpened against a stone, as was evident from the markings upon it, so that it was still a dangerous implement in the grasp of a determined man. It had evidently dropped from the fellow's hand at the moment when the sudden coming of the surgeon had driven him to flight. There could no longer be a doubt as to the object of his visit. And what was the meaning of it all? You ask. Many a drama which I have come across in my wandering life, some as strange and as striking as this one, has lacked the ultimate explanation which you demand. Fate is a grand weaver of tales; but she ends them, as a rule, in defiance of all artistic laws, and with an unbecoming want of regard for literary propriety. As it happens, however, I have a letter before me as I write which I may add without comment, and which will clear all that may remain dark. Sir – I am deeply conscious that some apology and explanation is due to you for the very startling and, in your eyes, mysterious events which have recently occurred, and which have seriously interfered with the retired existence which you desire to lead. I should have called upon you on the morning after the recapture of my father; but my knowledge of your dislike for visitors, and also of – you will excuse my saying it – your very violent temper, led me to think that it was better to communicate with you by letter. On the occasion of our last interview I should have told you what I tell you now; but your allusions to some crime of which you considered me guilty, and your abrupt departure, prevented me from saying much that was on my lips. My poor father was a hard-working general practitioner in Birmingham, where his name is still remembered and respected. About ten years ago he began to show signs of mental aberration, which we were inclined to put down to overwork and the effects of a sunstroke. Feeling my own incompetence to pronounce on a case of such importance, I at once sought the highest advice in Birmingham and London. Among others we consulted the eminent alienist, Mr Fraser Brown, who pronounced my father's case to be intermittent in its nature, but dangerous during the paroxysms. "It may take a homicidal, or it may take a religious turn," he said; "or it may prove to be a mixture of both. For months he may be as well as you or me, and then in a moment he may break out. You will incur a great responsibility if you leave him without supervision." The result showed the justice of the specialist's diagnosis. My poor father's disease rapidly assumed both a religious and a homicidal turn, the attacks coming on without warning after months of sanity. It would weary you were I to describe the terrible experiences which his family have undergone. Suffice it that, by the blessing of God, we have succeeded in keeping his poor crazed fingers clear of blood. My sister Eva I sent to Brussels, and I devoted myself entirely to his case. He has an intense dread of madhouses; and in his sane intervals would beg and pray so piteously not to be condemned to one, that I could never find the heart to resist him. At last, however, his attacks became so acute and dangerous, that I determined, for the sake of those about me, to remove him from the town to the loneliest neighbourhood that I could find. This proved to be Gaster Fell; and there, he and I set up house together. I had a sufficient competence to keep me, and being devoted to chemistry, I was able to pass the time with a fair degree of comfort and profit. He, poor fellow, was as submissive as a child, when in his right mind; and a better, kinder companion no man could wish for. We constructed together a wooden compartment, into which he could retire when the fit was upon him; and I had arranged the window and door so that I could confine him to the house if I thought an attack was impending. Looking back, I can safely say that no possible precaution was neglected; even the necessary table utensils were leaden and pointless, to prevent him doing mischief with them in his frenzy. P.S. — My sister Eva bids me send you her kind regards. She has told me how you were thrown together at Kirkby-Malhouse, and also that you met one night upon the fells. You will understand from what I have already told you that when my dear sister came back from Brussels I did not dare to bring her home, but preferred that she should lodge in safety in the village. Even then I did not venture to bring herinto the presence of her father, and it was only at night, when he was asleep, that we could plan a meeting. And this was the story of this strange group, whose path through life had crossed my own. From that last terrible night I have neither seen nor heard of any of them, save for this one letter that I have transcribed. Still I dwell on Gaster Fell, and still my mind is buried in the secrets of the past. But when I wander forth upon the moor, and when I see the little grey deserted cottage among the rocks, my mind is still turned to the strange drama, and to the singular couple who broke in upon my solitude. This page was last edited on 6 April 2019, at 18:25.